Fully revised, this second edition of a popular book contains the significant addition of a new chapter on Flow & Congestion Control and a section on Network Calculus among other new sections that have been added to remaining chapters. An introductory text, Queueing Modelling Fundamentals focuses on queueing modelling techniques and applications of data networks, examining the underlying principles of isolated queueing systems. This book introduces the complex queueing theory in simple language/proofs to enable the reader to quickly pick up an overview to queueing theory without utilizing the diverse necessary mathematical tools. It incorporates a rich set of worked examples on its applications to communication networks. Queueing Modelling Fundamentals is an introductory text for undergraduate or entry-level post-graduate students who are taking courses on network performance analysis as well as those practicing network administrators who want to understand the essentials of network operations. The detailed step-by-step derivation of queueing results also makes it an excellent text for professional engineers. Chee-Hock Ng is currently an Associate Professor in the School of Electrical & Electronic Engineering, Nanyang Technological University (NTU). He is also serving as an external examiner and assessor to the SIM University for its computer science programmes. 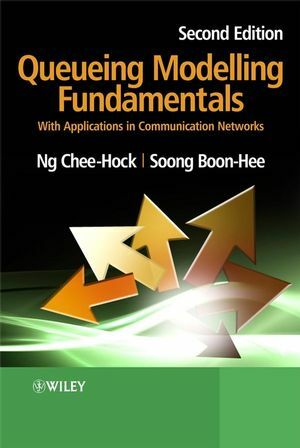 The author of the first edition of "Queueing Modelling Fundamentals", Chee-Hock Ng runs short courses to the industry and other statuary bodies in the area of networking.? A Chartered Engineer and a Senior Member of IEEE, he has also published many papers in international journals and conferences in the areas of networking. Soong Boon-Hee is currently an Associate Professor with the School of Electrical and Electronic Engineering, Nanyang Technological University. Previously a Visiting Research Fellow at the Department of Electrical and Electronic Engineering, Imperial College, London, under the Commonwealth Fellowship Award, he has served as a consultant for many companies including Mobile IP in a recent technical field trial of Next-Generation Wireless LAN initiated by IDA (InfoComm Development Authority, Singapore). Boon-Hee Soong was awarded the Tan Chin Tuan Fellowship in 2004. Author of over 100 international journals, book chapters and conference papers, he is currently a Senior member of IEEE and a member of ACM. 1.2. z-Transforms - Generating Functions. 2. Introduction to Queueing Systems. 2.1. Nomenclature of a Queueing System. 2.2. Random Variables and their Relationships. 2.5 Resource Utilization and Traffic Intensity. 2.8 Properties of Poisson Process. 3. Discrete and Continuous Markov Processes. 4.2. PASTA - Poisson Arrivals See Time Averages. 4.6. Erlang's Loss Queueing Systems - M/M/m/m Systems. 5.1. The M/G/1 Queueing System. 5.2 The Residual Service Time Approach. 5.3 M/G/1 Non-preemptive Priority Queueing. 5.5 The G/M/1 Queueing System. 6.1. Markovian Queries in Tandem. 6.2. Applications of Tandem Queues in Data Networks. 7.1. Jackson Closed Queueing Networks. 7.6. Application of Closed Queueing Networks. 8.1. Markov-modulated Poisson Process (MMPP). 9. Flow and Congestion Control. 9.3. Analysis of Sliding Window Flow Control Mechanisms. 9.4. Rate Based Adaptive Congestion Control.